Mexican Brownies have a deep moist chocolatey goodness with a back-end spicy hello, courtesy of a little cayenne! Everyone just loves this easy dessert. We had some friends over last weekend for a casual dinner. We were thinking that we would barbecue outside and just enjoy a beautiful evening. Well, this is Nebraska, and even though we have had a beautiful summer, we had a heat index of 105°F. Instead of subjecting our friends to heat stroke, we brought the party inside. 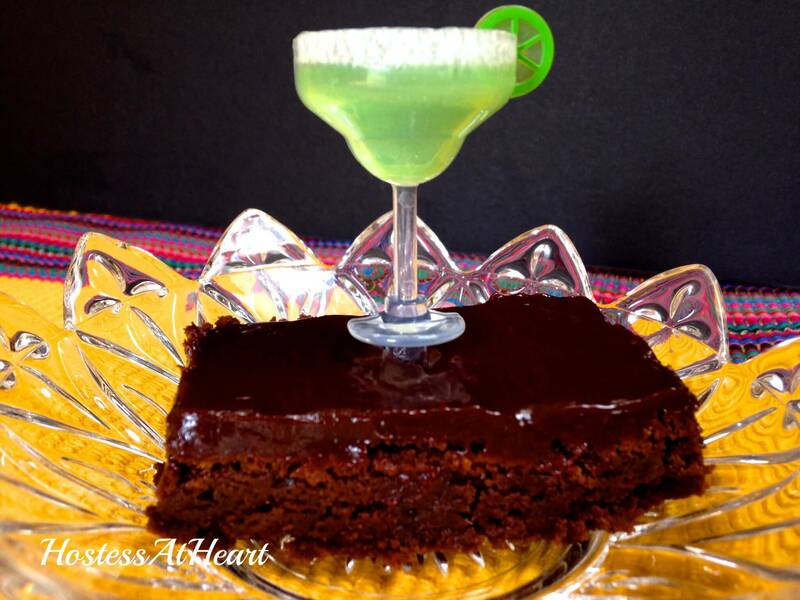 The Mexican theme just kind of took over, and I just had to include these Mexican Brownies. Deep moist chocolatey goodness with a back-end hello! Just one bite and my mouth was doing a serious happy dance of yum. When I have people over, I believe that there is nothing wrong with purchasing a couple pre-made appetizers, and I made some fresh guacamole and pico de gallo. Our drinks included cold beer, red sangria, and raspberry ice tea. We added fresh pineapple and grapes to the table when we put out some enchiladas that I made. I topped off our dinner with these Mexican brownies. One of our friends said that they were the best brownies she had ever eaten. You don’t specifically taste the cayenne called for in this recipe, but you get the heat in the after taste. Deep moist chocolatey goodness with a back-end hello, courtesy of a little cayenne. You're going to love watching your friends eat these delicious brownies when that little zing kicks in. Line a 13×9-inch pan with foil, making sure that the piece of foil is large enough to allow the ends of the foil to extend up and over the sides of the pan. Spray the foil with non-stick cooking spray. In a large microwave-safe bowl, add the chocolate and butter and microwave on high for 2 minutes. Stir until the chocolate is completely melted. Stir in the sugar, eggs, and vanilla. Stir to combine as much as possible (there may be some egg that doesn’t completely mix in which is perfectly fine). Add cinnamon, cayenne and flour and mix thoroughly. Let cool completely in the pan on a wire rack. When completely cool, use the foil to remove the brownies from the pan. Lay on flat surface and pull down the foil from the edges to expose the sides of the brownies. Prepare Ganache by combining all ingredients in a double boiler. Stir until completely melted and shiny. Pour over brownies, and smooth until ganache runs over the sides. Come on over and help me celebrate Fiesta Friday. My friends response to this recipe have me thinking this would be a great addition to the next party! Head over there and see some other great submissions for yourself! These brownies look AMAZING! Rich looking, gooey, chocolatey…it doesn’t get much better than that! Thanks Kelli! I think I am going to try them as my “go to” brownie without the cayenne. They are so good this way too. Thanks for visiting! Yummm! I love mexican chocolate things, I will definitely have to try these! Hope you enjoy them! Thank you. I’ve never cooked Mexican for a crowd – but there are some great ideas here….especially the irresistible brownies. Your entire meal looks so delicious. But as you say, it is about the brownies, and those really do look like winners. I love chocolate with spices, and the cinnamon and cayenne are a fabulous addition. And that ganache – just superb. I really want these now. Thanks so much for sharing. Thank you so much for your kind comments! I love to try different things, and love to share the winners! Life is short. Dessert first! They are yummy and chocolatey. Thanks for visiting. Thank you! They were a great finish to a spicy meal. That is quite a spread you put together. I love mexican hot chocolate so I bet I would love these as well. I love your margarita topper things too! Quite creative with the little martini glasses! I’d gotten the little glasses a few years ago, and they fit this occasion perfectly. Thank you for commenting. I would love to but think they may loose se of their charm after a couple days. They were! I may try and make them as regular brownies without cinnamon and cayenne too? Love it! I’d never had them before but they are a nice twist for a fiesta! what makes them Mexican? the cayenne? they sound delicious, thank you very much! 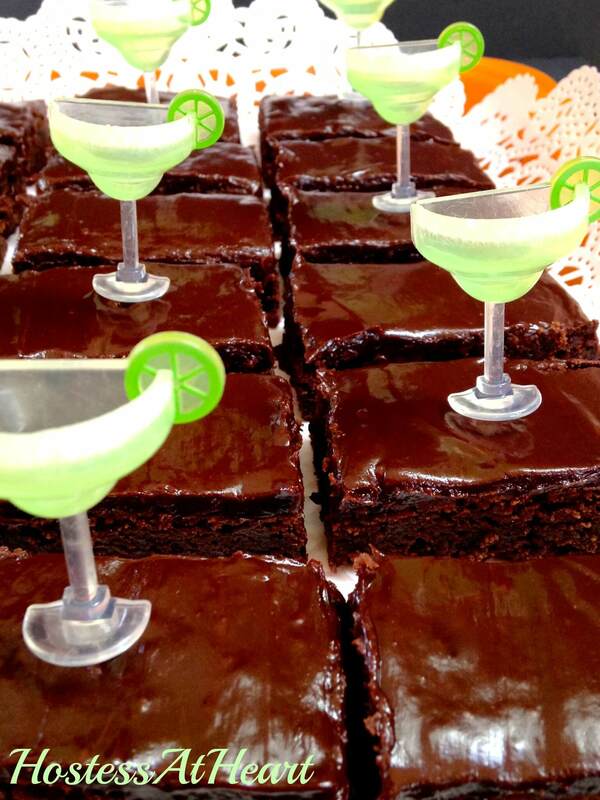 I love the brownies, so cute too with the margarita glasses atop. I am always searching for brownie recipes, must say these look especially good moist and chocolately. They are really fudgy and best of all easy! Thank you for visiting! Thank you Malar! I love chocolate!